Bergen, David. The Age of Hope. Toronto: HarperCollins, 2012. Bergen is one of my favorite novelists, and I just found out that he has a new book out. Unfortunately, it hasn’t been published in the U.S. yet–aside from Margaret Atwood and Alice Munro, Canadian writers get zero respect here–so I had to find a copy from Canada online. I was able to find one from a bookseller in Ontario via abebooks.com. Braddock, Jeremy. Collecting as Modernist Practice. Baltimore: Johns Hopkins UP, 2012. I have always loved collecting things, so this book sounded appealing. As it turns out, the book considers anthologies as collections as well as discussing collecting objects, which is something that I am also quite interested in. I am looking forward to reading it. This, Lukas’s, and Wiebe’s books were bought from amazon.com. Lukas, Paul. Inconspicuous Consumption: An Obsessive Look at the Stuff We Take for Granted, from the Everyday to the Obscure. New York: Crown, 1997. I really enjoy Lukas’s Uni Watch blog, in part because we share the same obsession with aesthetic detail. I just found out that he published this book on the subject fifteen years ago, and bought it right away. It looks like a nonfiction version of Nicholson Baker’s novel The Mezzanine, which is a good thing. Wiebe, Dallas. Skyblue the Badass. Garden City: Doubleday, 1969. I have been reading a fair amount of Mennonite literature over the past year after a long hiatus from the field. I’ve been struck by how few U.S. Mennonite novels there are in comparison to the Canadian tradition (including David Bergen), and have been making a concerted effort to read the few U.S. novels that do exist. Wiebe was one of the first U.S. Mennonite writers, but I’ve only read a few of his poems and one or two of his essays. All of his fiction is out of print, but I was able to find a copy of Skyblue the Badass (I couldn’t find any of Our Asian Journey) for $46.00. I bought it with some birthday cash. It’s in very good condition, and I love that the back cover has a note from my main man George Plimpton. 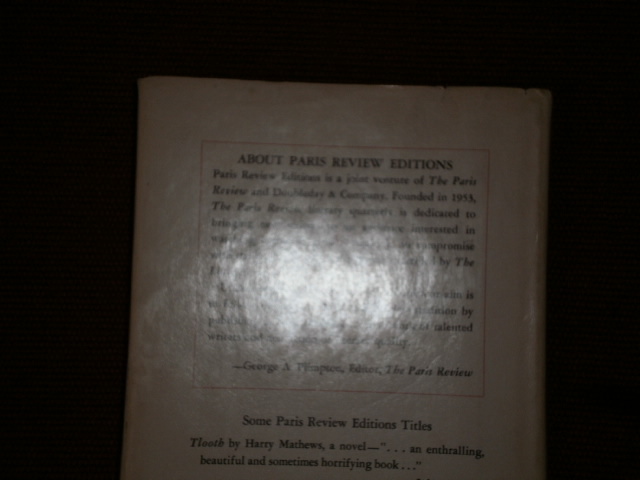 George Plimpton’s note about Paris Review Editions.